Ski boots are notorious for being uncomfortable foot wear. Well they do not have to be if you chose the proper boot and have it fitted. Here are three reasons why a correct fitted boot is needed to ski properly. 1 Comfort. Boots must be comfortable if you plan on spending any time on the hill skiing. Just as any footwear, ski boots come in different sizes. Typically your ski boots size not your shoe size. It is usually smaller. 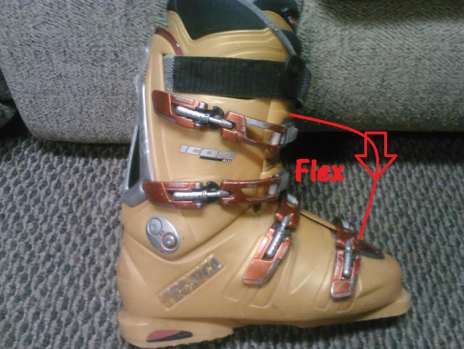 A good boot fitter measures your foot as to how it fits in the ski boot shell (see photo). With your toes touching the front of the boot shell (without the liner). The fitter determines how much room is between the heel of the shell and your heel. This length is determined based on the skier’s ability. A racer wants the tightest boot possible and will sacrifice some comfort. Just as good shoes come in width sizes (A through triple E), so do ski boots. Their width is called last. However, not every model ski boot come indifferent lasts. So you may not be able to get a specific brand and model if it does not come in your size. 2. Control. If a boot does not fit your foot snuggly and your foot slides either front to back or side to side, you will not have proper control over your ski. The movement in the boot is magnified by the length of the ski so when you put pressure to make a turn there is a loss of control as your foot slides before pressuring the ski. 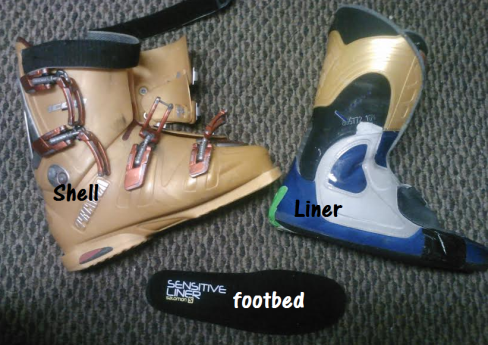 The best way to understand this is think that that your foot, boot, binding and ski all act as one unit. 3. Performance. High performance ski boots are quite stiff. Typically measured by the flex or pressure needed for the skier to lean forward on the front of the ankle. Flex is determined by a relative number typically 80-150, the higher the number, the stiffer the boot. The flex you need is dependent upon your strength, weight and ski ability. A racer uses a flex of 130- 150. Here again improper flex will affect performance. Too much flex will inhibit the ski from turning. Too little flex will not distribute the pressure properly again reducing performance. Once the best boot is chosen, there are many ways a boot fitter can make then comfortable without sacrificing control or performance. Boots can be modified by spreading, grinding and adjusting to remove pinch points. Boots should fit tightly but not hurt or cut off circulation in the foot. Many boot liners are moldable to the foot. They are heated prior to being placed in the shell or on the foot. They are allowed to cool which the foot is in the boot. Recently, boot manufacturers came out with moldable ski boot shells. The shell is made of a plastic which is softened by heating. Once soft, the boot, including liner, is put on. A cold pack is placed around the boot followed by a pressurized pack. It is then allowed to harden in place and thus mold to the foot. The manufacturer of this technique calls it “Vacuum Fit” which is a bit confusing as the technique utilizes pressure (the opposite of vacuum). Custom foot beds are a good choice. The foot beds are molded to the foot giving support to the arch and heel. Custom foot beds will help keep the foot in a neutral position giving the skier more control and comfort. It is critical to choose a boot that fits snuggly without pain and whose stiffness matches the skier’s ability. Just remember a good boot fitter can adjust the fit of the boot as necessary to be comfortable, maintain control and achieve the best performance.